I just didn’t see this. The Cowboys with a 7-1 record after eight games? With a backup quarterback? I mean a rookie backup quarterback. No way. I predicted the Cowboys would win the NFC East, but with eight wins. What we are seeing from the Cowboys is nothing short of shocking. This is a quarterback league and Dak Prescott is playing the position like a veteran just halfway into his rookie season. 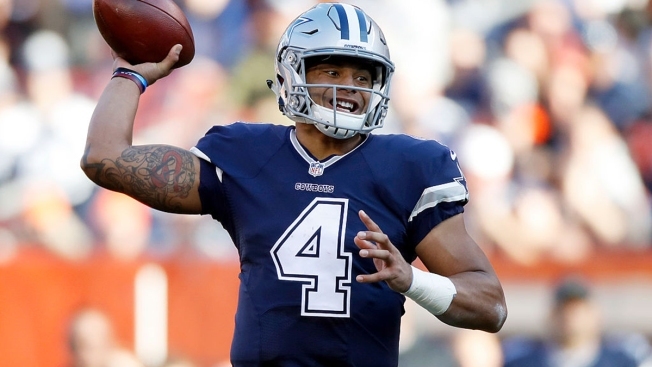 Sunday, in the 35-10 win over Cleveland, Prescott scored a 141.8 rating to mark his sixth game with a 100.0 rating, tied for fourth by a rookie quarterback in a single season in NFL history. He also threw for three touchdowns. I just don’t know how the Cowboys brass can give Tony Romo the job back. After the Browns win, Cowboys owner and GM Jerry Jones was excited about where the recovering Romo is saying, "Nothing but getting better and we'll certainly see him executing really well in practice." Dallas is on the road next week in Pittsburgh. After that, it’s a home game against Baltimore and then the annual Thanksgiving Day game against Washington in Arlington. What game is best to make a switch back to Romo? I just don’t see one right now. I’ve said before the Cowboys will need Romo to get where they want to go, which is deep in the playoffs. Right now, Dak Prescott simply has done nothing to lose his starting spot and I will be honest, I didn’t think I’d be saying that back in August.